33" High x 19" Wide x 14-1/4" Proj. 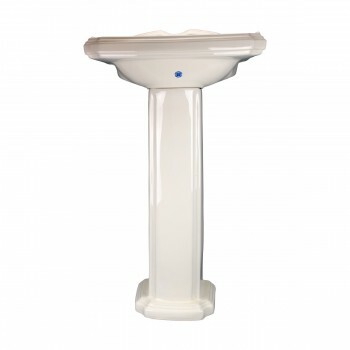 Traditional Pedestal sink: Classic bathroom basin sink with pedestal. Easy to clean Grade A vitreous china. Open backed pedestal for easy installation even with non-standard rough-ins. The Biscuit vitreous china cloak room Traditional Pedestal sink measures 19 in. wide, 33 in. high, projects 14 3/4 in., and is 5 3/4 in. deep. Backsplash is 1 7/8 in. high. Takes a 4 in. centerset faucet (not included).